At the beginning of March, a Korean team from TV channel TVN arrived in green, active and healthy Slovenia. Their stay will mark the filming of the Korean romantic drama “Dear My Friends”. At the beginning of March, a Korean team from TV channel TVN arrived in green, active and healthy Slovenia. Their stay will mark the filming of the Korean romantic drama “Dear My Friends”. Ljubljana, the European Green Capital 2016, Piran, and Bled will host the filming crew, who will create approximately 50 minutes of video material, which will be shown in 5 or 6 episodes of the Korean series. The filming in Slovenia will take place for two weeks. Viewers of the Korean series will enjoy the scenes from Slovenia in May. The importance of Slovenia as a film destination for the popular Korean romantic drama “Dear My Friends” is recognized by the Slovenian Tourist Board (STB), since it will increase the visibility and recognition of our green, active and healthy country for Korean tourists. To host the Korean film crew, the STB is closely cooperating with local tourist providers and tourist destinations. The Korean and Asian incoming market is of great importance to Slovenian tourism and has potential for further growth. “The number of arrivals and overnight stays of Korean tourists in Slovenia has increased by 18 times in the last ten years, and exceeded 92,000 overnight stays in 2015. The filming of the popular Korean series in Slovenia is a great promotion for Slovenian tourism. The Slovenian Tourist Board will organise a presentation of the range of Slovenian tourism to Korean tour operators, and a press conference to expose the launch of the new TV series, recorded at selected Slovenian destinations,” commented Maja Pak, the Acting Director of Slovenian Tourist Board. This is not the first time Slovenia has hosted an international film crew. In 2007 the Soča River near Bovec was a backdrop to the film The Chronicles of Narnia: Prince Caspian, and Ljubljana hosted a Bollywood film crew in 2012, for the movie Nayak. 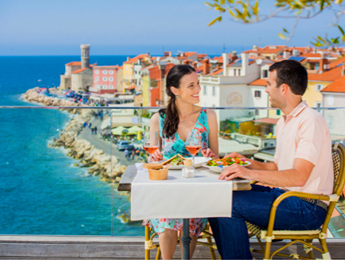 Be up to date about what’s happening in Slovenian tourism. By subscribing to our press newsletter you will receive the latest business news in the field of tourism and other current information on a weekly basis.